An important focus during the postpartum period is “adjustment.” For parents, this means an adjustment in time management, balancing responsibilities, and activities you might never have pictured yourself doing (i.e., declawing those Edward Scissorhands-esque newborn nails, storing iPhone videos of teeny, tiny hiccups, and notating diaper contents for the pediatrician that would put professional anthropologists to shame). For birth mothers, you can add a whole spectrum of physiological adjustments to the list. It can take many months, sometimes years, for your body to physically and hormonally resemble its pre-pregnancy self. This gentle postpartum sequence is tailored for mothers who have recently given birth and have been medically cleared to exercise. Since time is more of a luxury than ever, now that your baby's here, this practice is divided into sections that build upon each other—allowing you to practice as your schedule allows. Helpful props include two blocks and a bolster (or two blankets). Please note that it is always best to discuss with your prenatal and postnatal health care provider(s) when it is safe for you to resume any type of physical activity. Have a few minutes to yourself? Let’s roll out the mat! This first section includes focused breath work to help revitalize your mental alertness and clarity, both of which may be foggy after weeks of broken sleep. It also includes yoga poses that focus on opening the chest to counter all that hunching over your little one, and pelvic exercises to help strengthen an area that, well, may have gone through a lot in the last few months! Hold each pose for three to five breaths unless stated otherwise. Most people are shallow breathers, usually filling only a portion of the lungs during a typical inhale. The breathing process can become even shallower (or pause completely!) during periods of stress. Conscious, diaphragmatic breathing means taking deep, richly oxygenated inhalations and complete exhalations; this, in turn, signals your body's relaxation response. This practice can be a great support to you during postpartum hormonal shifts, while adjusting to a new lifestyle rhythm, and during all of the unexpected situations that pop up in parenthood. Begin by lying on your back. Your legs can simply be long (such as in savasana), or your knees can be bent (with feet flat on the floor), or supported by placing a blanket or bolster directly under the backs of your knees. Place your left hand on your belly, and your right hand over your right ribs. Take a few moments to notice your breath in its current state, without making any changes. Then, consciously begin to inhale through your nose, expanding your chest and rib cage, and feeling your belly rise. Exhale through your nose slowly and with control, drawing your belly back toward your spine. Focus on maintaining a smooth, steady breath with equal lengths of inhalation and exhalation. Notice how your right hand lifts as you expand your rib cage, and how your left hand lifts as you expand your belly; notice how your hands lower as you cycle through the exhalations. Stay for at least five rounds of breath. The pelvic floor consists of muscles around the pelvis that support the bladder, lower intestines, and uterus and hold them in place. These muscles stretch in order to allow the fetus to grow, and then for childbirth to occur. After childbirth, these muscles may need to be strengthened or stretched in order to work optimally, and this will vary by individual. Take a few moments to notice this area on your own body. Bring your attention to the area between your pubic bone and tailbone. Notice if you can intentionally contract and then release the muscles here. Exhale as you contract the pelvic floor; inhale as you release the pelvic floor. Focus as much on releasing as you do on contracting, and notice if you can control the length of each. Begin by lying on your back, with knees bent and arms by your sides with palms down. Ground your feet firmly onto the floor, about eight to twelve inches from your hips. Bring your attention to the area between your pubic bone and navel. On an exhale, contract between the pubic bone and navel to tilt your pelvis back slightly, allowing your lower back to gently press into the mat. On an inhale, relax the contraction between the pubic bone and navel to tilt your pelvis forward so that your lower back arches away from the mat. Take a few rounds of these posterior and anterior tilts, before settling at what feels like the halfway point between the two. Then, place a block between your inner upper thighs (you may need to experiment to determine the width that works best for you). Exhale, hug the block with your inner thighs. Keep hugging the block as you inhale and lift your pelvis off the floor. Notice if your glutes are taking over, causing your legs and feet to turn out. If so, realign your feet and try squeezing the block a little more firmly to bring more muscle action to the inner thighs (which support the deeper pelvic floor muscles). Lower to the floor on an exhale, focusing on the release of both breath and muscle tension. One “lift and lower” pair counts as one round. Continue on for a total of three to five rounds, inhaling as you lift, exhaling as you lower. Come to tabletop position with your knees hip-width apart and stacked under your hips and your hands shoulder-width apart (or slightly wider) with your wrists directly under or just slightly forward of your shoulders (whichever feels most comfortable). As you exhale, draw your tailbone down and round your back, bringing your gaze toward your belly; push down firmly through your hands as though you were pushing the floor away from you. As you inhale, move your hips back, your chest forward, and look up just slightly. Repeat for a few more rounds before returning to a neutral position, or shake up this traditional pairing by adding some fresh, freestyle movement into the mix. For instance, allow one shoulder to dip, then the other. Isolate your rib cage and circle it around in both directions. Then, slowly drop your hips toward the left heel, circle back up to center, then drop your hips toward the right heel before bringing the movement back to your shoulders. Explore and let yourself be inspired to twist, rotate, or hold any which way! The cow/cat duo (and the remix!) is great for bringing gentle movement back to your body after some time away. Enjoy the sensation of freeing stiff and stagnant back and hip muscles, which are often primary “new mom” complaints. Carrying a baby, and all that it entails (the snuggling, rocking, nursing, bottle-feeding, and staring-for-hours action) can leave you in a slumped position more often than you're used to (double trouble if you're also sharing baby pictures from your phone all day!). This can lead to tight chest muscles and rounded shoulders, and possibly some upper back discomfort. To combat this, come to a kneeling position and then sit your hips back either onto your heels or a block between your feet. On an inhale, bring your arms overhead, and then widen into a V-shape. Imagine your energy extending out through your fingertips. On an exhale, bend your elbows to goal post arms. Broaden your chest and draw the bottom tips of your shoulder blades toward one another. Then lower your hands down to the mat, behind you, fingertips pointing forward. Press firmly into the floor, spread through your collarbones, and lift your chest toward the ceiling and hips up. As your chest lifts, you can move your head back to continue the arc of the backbend, opening your throat, making sure to keep the back of your neck long. Kiddo still napping? Awesome! Let’s tack on a few more strengthening poses. If the baby's up, this sequence is arranged so that you can always return to where you left off. As mentioned earlier, holding and attending to your baby throughout the day can place a burden on the upper body. This pose will help stretch your shoulders and open your chest. Begin in tabletop position, with your toes tucked under. Engage the muscles of your lower abdomen, pelvic floor, and inner thighs. As in the pelvic lift exercise we did earlier, holding a block between the inner upper thighs here can help with pelvic floor toning. Walk your hands forward, allowing your chest to broaden and your forehead to lower toward the mat. Depending on what feels best for your body during this practice, you have a few options for where to “hold” in this posture. You can bring your head between your arms with your ears in line with the biceps (as in downward facing dog). Or you can rest your head on a block or bolster for a more supportive variation. Finally, you have the option to bring your forehead all the way to your mat. When you've found the variation that works for you, draw your lower ribs back. Imagine sending the breath of your inhalations to the space of your lower back, while picturing a long straight line of energy from the base of your skull up to the hips and tailbone (this area remaining stacked over the knees). From anahatasana, return to all fours. Have your block handy. Walk your hands forward about one handprint, spreading the fingers and rooting through the knuckle mounds. Tuck your toes, and lift your hips skyward and back. Press down into the fleshy mounds below your index fingers and thumbs, and rotate your upper arms outward. “Pedal” with each leg, bending one knee and then the other, before bringing the legs to stillness. Internally rotate your thighs and press them toward the back of your mat; stretch down through the center of your heels. Don't worry if your heels don't touch the mat! In fact, keeping a gentle bend in the knees (and perhaps even placing a rolled-up blanket underneath the heels) can help you to find more spinal extension (length) in this pose. To cultivate more pelvic stability, you can squeeze a block between your thighs like you did during the pelvic lifts. You can also try placing a block underneath your forehead to make the pose a little more restorative (experiment with different block heights to see what feels best). This posture is full of head-to-toe benefits. It helps strengthen the arms and the shoulders—all the better to help you haul around the kiddo, car seat, and diaper bag! It also lengthens the back of the body and the legs, which may feel heavenly if you've recently spent more time being sedentary. The inversion quality of this pose is invigorating and might help you ignore the fact that you recently may not have slept more than two-hour stretches at a time. Finally, some new moms even report that it helps with digestion issues. 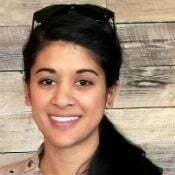 Digestion can sometimes be a concern for new mothers in the postpartum period, especially if you were on any pain medications during birth or recovery. 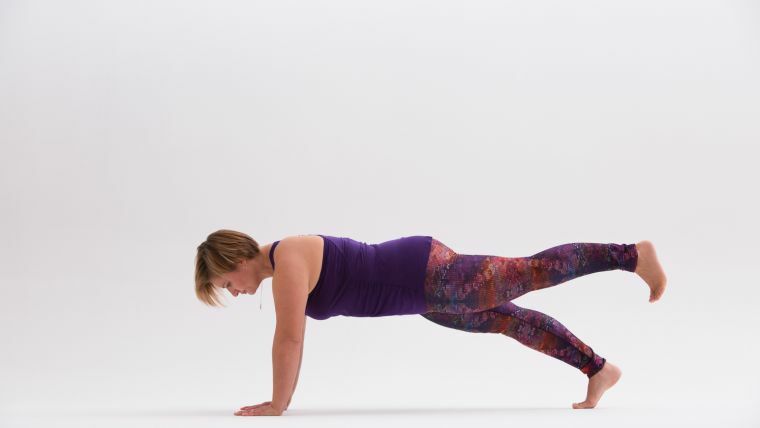 From adho mukha svanasana, roll forward to a high plank. Feel free to lower one knee to the floor for a supported plank variation. Press your hands into the floor, as though you were pushing it away from you, to help engage your deep abdominals (which become stretched and weakened during pregnancy). Activate your glutes without clenching them, as well as the entire length of both legs, to prevent drooping of the torso. If you are in the supported plank variation, be sure to hold evenly on each side. Something to note: A number of women experience some degree of abdominal separation, called diastasis recti, in the connective tissue between the left and right halves of the rectus abdominus muscles. Your health care provider can usually help you determine if you have this separation, where along the rectus abdominus the separation lies, and the degree of separation. If you have postpartum diastasis recti, especially to a larger degree, abdominal flexion exercises such as the knee tuck exercise listed here are not recommended. Instead, check with your health care provider or a postpartum movement specialist about exercises that would support strengthening the abdominal wall. Add in this exercise for additional core strengthening. Begin in plank or tabletop. On an inhale, lift your right leg straight back. Flex your foot so that your toes point down toward the floor. Keep an active foot and level hips. As you exhale, bring your knee toward your chest, rounding your spine. Extend the right leg back on your next inhale, then return to plank or tabletop. Repeat with the left leg. Finish with a couple of gentle poses to allow your mind and body a “refresh” from any stressors you may be currently experiencing. Have a block nearby. Lie down on your back, with knees bent and feet flat on the floor (almost as if you were preparing for bridge pose). 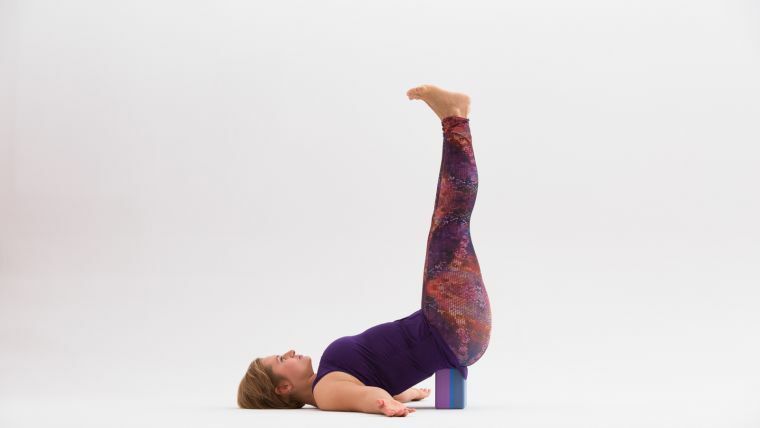 Lift your hips and place your block directly under your pelvis on its second-highest height (you may need to play around with the block placement to find the spot that provides the most support for you, and you can certainly use the widest, lowest block placement if that feels best). Then, with your hands palms down, press your hands, forearms, and upper arms firmly into the mat. Draw your knees in toward your belly, then extend one leg upward toward the ceiling. When you feel supported and stable, extend the other leg upward toward the ceiling. Keep both feet active. You may want to turn your hands palms up and bring them slightly away from your midline to gently open your chest. Protect your neck by maintaining space between the back of your neck and the mat. Hold for three to five breaths. To come out of the pose, draw one knee in toward your belly, and then the other. Place both feet flat on the floor and remove your block. Lie on your back with both knees bent and feet flat on the floor. Extend your arms out to a “T.” Press your feet into the floor and shift your hips over to the right, and on an exhale, drop your knees to the left for a gentle twist. Keep your gaze toward the ceiling, or turn your head to the right if that feels comfortable for your neck. After three to five breaths on this side, return to center on an inhale. Repeat on the second side. Spend a few minutes in this final resting posture. You can even involve baby here by hugging him/her close to your chest if you'd like! Focusing on deep, balanced breaths during this last pose may not only be restorative for you, but can also be soothing for the baby on your chest. A final note: When you have those days where even a short asana session is too much to fathom, lie down with a guided yoga nidra practice. Incorporating this deeply restoring practice regularly into your new routine can help diffuse the stress that comes with adjustment, aid in physical healing, and provide sorely needed boosts of mental and physical energy.